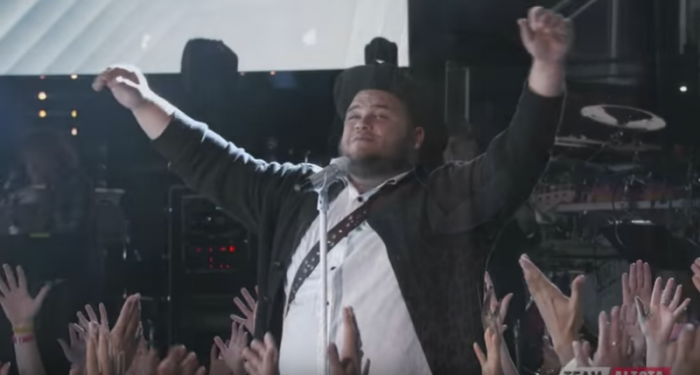 Even though Christian Cuevas was eliminated on NBC's singing competition "The Voice" Tuesday night after his rousing performance of Israel Houghton's "To Worship You I Live" in the semi-finals, one celebrity fan said she was in awe of his performance. Adrienne Houghton, co-host of the daytime talk show "The Real," said Cuevas' emotional performance of her husband's song left her feeling inspired. "Wow. Still in awe and inspired. Everyone knows that I absolutely love singing competition shows. But, last night I was completely blown away when Christian from #TeamAlicia on @nbcthevoice chose to perform a worship song," Adrienne wrote on Instagram Tuesday. "He could have chosen any song to sing. But instead, he decided to take that moment and worship God. To top it off, he chose my husband's song, 'To Worship You I Live.'" Alicia Keys, the R&B singer who served as Cuevas' coach on the singing competition, sang along to the song that professes worship to God. "I was so moved. Seeing @aliciakeys singing along. Seeing God at work on national television. Such an incredible moment," Adrienne wrote. Houghton also took to his own Instagram account to reveal that he was honored to witness Cuevas' performance of his song. "Came to support my friend, the incredible @christiancuevasmusic tonight @nbcthevoice. I'm so honored that he chose to sing one of my songs 'To Worship You I Live.' I Love his humble heart and his willingness to honor God on any and all platforms," he wrote. "Shout out to @aliciakeys for coaching him through and allowing this moment to happen." After Cuevas was eliminated from "The Voice" on Tuesday, Keys took to social media to let him know how special his talent was. "@ChristianCuevasMusic I have been in awe of your talent since your blind audition," she wrote. "Thank you for your outpouring of light and love thru music. Y'all look out for what's to come from my brother." Even though he will no longer be able to move forward in the singing competition, Cuevas took to Instagram to glorify God and address his supporters. "Just know that God has been so good and you guys are in for a journey. Please don't forget about me," Cuevas wrote. "This is where the magic happens." Watch the video below to see Cuevas' inspiring rendition of "To Worship You I Live" which became a top 10 single on iTunes charts this week.